If you love color and love learning amazing techniques, then learning about torch fired enamel jewelry making (and how easy it is) is going to knock your socks off. How to Enamel a Bead : This beginner how-to article is a must read before you move on to the project. You'll learn how to set up your torch, your workspace, and how to enamel your very first "fire painted" bead. 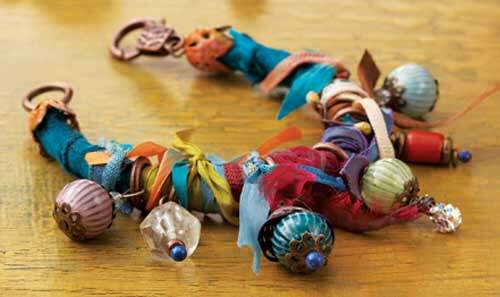 Tutorial courtesy of Jewelry Artist and author, Barbara Lewis). Learn how to make this gorgeous "Harem" bracelet (or anklet) with your enamelled beads. You can make this project with regular beads too, but it's really something else with the torch fired enamel beads, don't you think? These supply and resource links will lead you to sites for learning more about enamel jewelry making and where to get supplies and tools. You'll also find links to videos, books, other articles, and more.